1. MAD MAX: FURY ROAD – it’s always a treat to have really high expectations for a movie and then to see them exceeded. George Miller’s return to the wasteland of his career-defining trilogy is a perfect example of this phenomenon. The first time I saw it, though, Fury Road appeared to only meet my expectations, a rare enough feat in its own right. It was the second viewing that made me realize that this was not only my favorite movie of the year, but also my favorite Mad Max movie, and quite possibly my favorite movie of the last two decades. Then I saw it three more times in the space of about two weeks, and I noticed something new about it every single time. The rich, detailed world-building not only rewards but demands multiple viewings, and it’s a testament to Miller’s craft that the movie doesn’t rely on a lot of expository dialogue and other hand-holding devices to make sure the audience can keep up. Max Rockatansky’s world of “fire and blood” has its own language that is every bit as evocative and original as its eye-popping visuals: War Boys, Blood Bags, Bullet Farms, etc. This is a movie in the glorious pulp tradition of Robert E. Howard and Heavy Metal magazine, but it never feels derivative, even of its own source material (The Road Warrior being the original Mad Max movie it most closely resembles). What seems to be overlooked in all the talk about its incredible visual effects and stuntwork (which makes a better case than any movie I can think of for an Oscar category devoted to the people who risk their lives to make movies awesome) is the quality of the writing and performances. Charlize Theron and Nicholas Hoult are especially great, but there is also a surprising tenderness and depth to Tom Hardy’s performance as Max, a man of few words and great stoicism, and Melissa Jaffer managed to break my heart with just a few minutes of screen time as the Keeper of the Seeds. Critics and skeptics say this movie is just one long chase scene, which is reductive, but even if that were strictly true, complaining about that misses the point of how amazing it is that a movie this compelling could be made from a single long chase. Others might say it doesn’t belong in the Best Picture Oscar race because it’s not serious and important enough, but its themes of feminism and environmentalism are extremely relevant; they’re just not belabored to the point of didacticism. Fury Road’s vision of the destruction of the Old World, in which water was plentiful and “everyone had a show,” seems all too plausible, despite its over-the-top visual antics, and there’s a funny/scary comparison to be made between the film’s main villain, Immortan Joe, and a certain current Presidential candidate. I have no doubt this movie will ride eternal in Valhalla, shiny and chrome. It is perfect in every way. 2. ZOMBEAVERS – an old friend of mine back in Minneapolis, the late, great Terry Blue, used to do a Top 30 list every year, and he said he always reserved the #30 spot for a movie that he just personally liked, even if he felt it wasn’t objectively worthy. That was because Terry, unlike myself, actually made some attempt at objectivity. I’m more likely to reserve the #1 spot for the trash movie that just made me really happy. This year, though, a certain indisputable cinematic masterpiece pushed it to #2. Zombeavers delivers exactly what the title promises: zombie beavers, and a whole lot of them. Purists would argue that they’re not really zombies, as the monsters in question were created by an accidental chemical waste spill, but then again, no one but me is even talking about this ridiculous movie. If you want a fun, self-aware movie that functions equally well as a legitimate horror movie and an insane comedy, though, this is the way to go. It’s under 80 minutes and streaming on Netflix, so what are you waiting for? Watch it all the way through the credits, too, for a hilarious feature-capping, lounge-style theme song. 3. INSIDE OUT – much like Fury Road, this one has a few skeptics amidst the throngs of rightful admirers, and their criticisms are equally asinine. You may have seen the meme: “Toy Story = what if toys had feelings… Cars = what if cars had feelings,” etc. It all culminates in Pixar’s latest (at that point), “Inside Out = what if feelings had feelings?” That is what the movie’s about, but anyone using that as a criticism is missing the point: “what if feelings had feelings” is a fantastic premise for an animated movie, and Inside Out executes it perfectly. (Our site’s founder and owner said it’s a great Herman’s Head reboot, and if you get that joke, you’re probably at least as old as us.) This movie is colorful and fun enough for the kids, but it’s the older members of the audience, who have been through more of the constant ups and downs, triumphs and disappointments, joys and heartbreaks of life, who will really get the most out of it. Its most profound insight is that all happy memories turn into sad ones, because those happy moments are now in the past, but it wonderfully illustrates how sadness is healthy and necessary in a way that few movies (especially ones aimed at all ages) have accomplished. 4. ROOM – a more conventional and accessible take on similar material as my beloved Dogtooth, this is one of the more emotionally wrenching movies of the year. Brie Larson gives a stunning breakout dramatic performance as a young woman who was kidnapped at age 17 and held prisoner for seven years in the backyard shed of a psychopath. Two years into this hellish nightmare, this human monster impregnated her, and now she has a five-year-old son, Jack, who has never known a world outside of “Room,” as they call their prison. In order to protect Jack from the awful truth, she has told him that dogs, other people, and everything else he’s seen on the TV are just make-believe, and that “Old Nick” (their name for her anonymous abductor) is not their friend, but he is the one that brings them food and other necessities, so they have to keep him happy. Chilling stuff, and that’s just roughly the first half of the movie. Once they manage to escape, it’s another huge ordeal to get used to the real world, especially for “Ma,” as Jack knows her, who has to cope with how her relationship to that world has forever changed. Relief quickly turns to anxiety and depression for her, while young Jack is initially overwhelmed, but more quickly able to adapt to his huge new world. Jacob Tremblay gives a wonderful performance as Jack, and Emma Donoghue’s screenplay, based on her own novel, is beautiful and heartbreaking. Room, though, is more than the sum of its parts; this is a great movie. 5. EX MACHINA – for many, including myself, Drive was our first glimpse of the terrific actor Oscar Isaac. For most, Inside Llewyn Davis was the movie that proved him as a star, and of course his character in the new Star Wars trilogy, Poe Dameron, will convert a whole new swath of the population into fans. For me, though, this is the best role he’s taken on yet, and his most compelling performance to date. Eccentric and enigmatic tech billionaire Nathan Bateman selects one “lucky” employee, Caleb Smith (Domhnall Gleeson, suddenly ubiquitous this year), to join him at his top-secret home in the middle of nowhere for what turns out to be a very intriguing experiment. 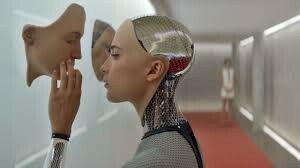 Can Nathan’s latest AI creation, Ava (Alicia Vikander), convince Caleb that she is human, despite the fact that he knows from the outset she is not? It’s a fascinating twist on the Turing test, and many more perfectly executed twists follow. First-time director Alex Garland’s excellent screenplay could be pitched as “What if Her (or maybe Weird Science) was a really dark thriller?” However, the resulting movie is even better than that sounds. 6. GOODNIGHT MOMMY – if Zombeavers is the most fun horror movie of the year (and it certainly is), this one is the most harrowing. Brutal and unrelenting, it expertly pokes at every phobia you could possibly have. Scared of bugs? This movie’s got you. Squeamish about your eyes? Check. Are you, perhaps, frightened by creepy children, especially twins? Oh, this movie’s got creepy twins, all right. The creepiest. A lot has been made of this Austrian film’s big twist (I like to think of it as what might happen if Michael Haneke directed The Sixth Sense), but if you want a big, surprising twist, this isn’t the movie for you; you’re meant to gradually understand what’s really going on long before it’s definitively revealed. If you want a truly frightening slow burn that completely wrecks your feelings of safety and security within the family unit, look no further. 7. CALL ME LUCKY – Bobcat Goldthwait has long ago transitioned from “that guy with the funny voice” to a deservedly respected filmmaker, working primarily in the genre of dark comedy. 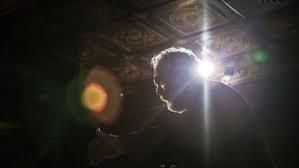 Not counting the elaborate prank Windy City Heat, this is his first true documentary, a look at the life, work and influence of Boston comedian and political satirist Barry Crimmins. Like one of the year’s other best documentaries, What Happened, Miss Simone?, this is an intimate and often heartbreaking portrait of a troubled artist whose work is inextricable from their political and social beliefs. Unlike that film’s subject, the great Nina Simone, I had never heard of Crimmins before this movie, and it seems as though that’s how he would prefer it. An uncompromising curmudgeon, Crimmins is also a powerful and fiery activist, an undeniably funny writer, and most importantly, a genuinely decent human being. Goldthwait and the many other comedians who appear in this movie have an obvious affection for him, and that feeling is infectious. 8. PREDESTINATION – I would call this the most underrated movie of the year, but I get the feeling hardly anyone even saw it, so I’ll save that distinction for another unfairly maligned sci-fi movie. Anyway, I’m a sucker for a good time-travel story, and this is quite possibly the most audacious one ever made. Based on Robert A. Heinlein’s classic short story, “All You Zombies,” which was already notorious for its audacity, The Spierig Brothers take it even further. To explain the intricacies of the time-travel paradoxes in this one would ruin everything, but as it goes on, you’ll likely find yourself guessing, then assuming you can’t be right because that would be too far-fetched, only to be surprised three or four more times before it’s over. The Spierig Brothers, who began their career with the awesome zombie/UFO movie Undead, are clearly not wishy-washy about committing to the most insane high-concept premise and executing it as beautifully as possible. Here, they blatantly rip off at least two shots from Se7en, one of my all-time favorite movies. That should have made me mad, but it only made me love this crazy movie more; in it, I felt a bizarre kind of kinship. 9. THE LOOK OF SILENCE – this is my pick for most important movie of the year, and it would probably be higher on the list if it weren’t for how devastatingly, gut-wrenchingly heavy it is. In other words, this is absolutely a great movie, and worth seeing more than once, but it’s not really a lot of fun. Joshua Oppenheimer’s follow-up to his similarly intense 2012 documentary The Act of Killing focuses on the family of one of the many victims of the Indonesian genocide explored in both movies. Adi Rukun, the victim’s brother, is an optometrist who meets with several of the genocide’s perpetrators under the guise of free eye exams in order to ask them some of the tough questions they don’t want to hear. Their reactions vary from anger to chilling calm; in the film’s most horrifying scene, one of the death squad leaders basically threatens Adi’s life. The subject matter is grim, but there is a faint glimmer of hope, which is part of what makes this one even more effective than The Act of Killing. 10. 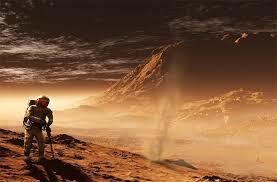 THE MARTIAN – consider this the antidote to the heavier movies on the list, such as Room and The Look of Silence. Again, if I were making any attempt at objectivity, this spot would probably be filled by Spotlight, which is pretty much a perfect movie. There’s a reason this is called “Ezra’s Favorite Movies of 2015,” though, and not “The Best Movies of 2015,” and, along with Mad Max: Fury Road and Zombeavers, this is one of the most purely fun movies I saw all year. Drew Goddard, the visionary behind Cloverfield and The Cabin in the Woods, infuses the screenplay with a crowd-pleasing, smartass wit, and Ridley Scott’s direction hasn’t been stronger since 2000’s Gladiator. Beyond the often very funny and always intelligent script and the awe-inspiring 3D visuals, though, what really carries the movie is Matt Damon’s all-American charm. The Martian has been rightly compared to movies like Gravity, Interstellar, and Apollo 13, but I like it better than all three. Anomalisa; Appropriate Behavior; Bone Tomahawk; Bridge of Spies; Carol; Crimson Peak; Dope; Faults; The Final Girls; Mississippi Grind; The Nightmare; The Overnight; Phoenix; Results; Sicario; Spotlight; Welcome to Me; What Happened, Miss Simone? ; What We Do in the Shadows; The Yes Men Are Revolting. WORST MOVIE OF 2015: KILL ME THREE TIMES – plenty of crap gets released in any year, from the laughably wrongheaded (The Cobbler) to the horrendously vile (The Human Centipede 3), but nothing annoys me more than mediocrity, and this one has that in spades. Who would have thought we’d be suffering through a terrible early Tarantino knockoff as late as 2015? Not even the charm of Simon Pegg can save this inane, needlessly convoluted, painfully unfunny mess. MOST UNDERRATED: CHAPPiE – critics, by and large, tore this movie apart, but everyone I’ve talked to about it really likes it. I’m going with the people on this one. 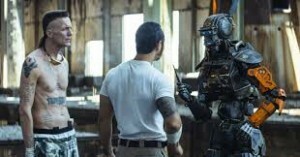 Writer-director Neill Blomkamp’s third feature wears its influences on its prison-tattooed sleeve, from his obvious love of ‘80s sci-fi/action thrillers like RoboCop to the casting of South African rap duo Die Antwoord as (basically) themselves, but it’s more than just self-indulgence by a talented fanboy. There’s real heart in the relationship between the robot CHAPPiE (voiced by Sharlto Copley) and his surrogate parents (Die Antwoord’s Ninja and Yo-Landi Vi$$er), as well as the unpretentious but still recognizable theological implications of his feelings toward his “Maker” (Dev Patel) and the “Bad Man” (Hugh Jackman). CHAPPiE, then, is all of us as innocent children, struggling with notions of good and evil with only the guidance of our moms and dads, who are probably way more screwed up than we can possibly imagine (though hopefully not as bad as Die Antwoord, for god’s sake!). Tackling ideas of identity and the human soul is common for more serious-minded sci-fi movies, but it’s rarer to see it in such a compulsively fun thriller as this. MOST OVERRATED: IT FOLLOWS – my fellow horror fans are really going to hate me for this. In fact, this movie probably converted a bunch of new horror fans just to hate me for this, since audiences and critics seem to be united in almost universal love for this movie, almost as much as a certain other one on which I wholeheartedly agree with them (I don’t think I need to keep typing his name. You know his name. His name is Max, and his world is fire and blood). So let’s get some praise out of the way: as a scary movie, this one is undeniably effective. I know this because, as I walked out of the theater, I found myself looking compulsively over my shoulder and growing paranoid about a guy who seemed to be following me for a couple of blocks. As quality cinematic storytelling, though, it left me underwhelmed, especially in the third act. The big swimming pool setpiece, for example, makes no sense, is ripped off from Let the Right One In, and isn’t even half as cool as that one. Don’t get me wrong, I do like this movie overall (certainly more than last year’s pick in this category), and I can tell it probably deserves at least a second viewing, but when it comes to the new American horror renaissance, I’ll take You’re Next or The Guest (the latter of which also stars Maika Monroe) over It Follows any day. PLEASANT SURPRISE: CHI-RAQ – I’ve been a big Spike Lee fan since I was nine years old, when Malcolm X was released (and yes, it was weird being a nine-year-old white kid in Missouri who was suddenly obsessed with el-Hajj Malik el-Shabazz), so it’s been disheartening for me to see a lot of his recent output. Basically, in the past decade or so, most of his best movies have been projects he was hired to direct, while the ones he’s written himself have been much more underwhelming. Red Hook Summer and especially this year’s first Spike Lee Joint, Da Sweet Blood of Jesus, were practically unwatchable for me, so when he released his second film of 2015, it felt like a bit of a last chance. If I couldn’t get into this one, I thought, I might not even bother with his next one. 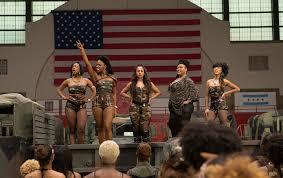 So it was a definite relief to find that I very much enjoyed Chi-Raq, Lee’s semi-musical update of the classic Greek tragedy Lysistrata to Southside Chicago gang warfare in the present day. Samuel L. Jackson narrates the film as Dolemides (and if you don’t get that reference, there’s almost no chance you’ll like this movie), Nick Cannon is surprisingly convincing as a gangbanger, and John Cusack delivers one of his best performances, but the biggest treat for me amongst the cast was seeing Angela Bassett in a major role again, and she’s terrific as always. Out of all of Lee’s past work, the style and energy of this one feels most similar to Bamboozled, which I’ve always felt was his great underappreciated masterpiece. Like Bamboozled, Chi-Raq is a bit of a mess, but it’s a fascinating mess with the distinctive flavor of a true artist realizing his uncompromised vision. BEST SCENE IN AN OTHERWISE MEDIOCRE MOVIE: THE RIDICULOUS 6 – The Ridiculous 6 is not a great movie. Shocking, I know. However, it’s not half as bad as it could have been, and one scene in particular is actually very good. John Turturro makes a (not very surprising, considering his past work with Adam Sandler) cameo as Abner Doubleday, the purported inventor of baseball. The movie imagines this legendary event as the equivalent of Calvinball, in which Turturro’s overgrown-child take on Doubleday simply makes up rules in his own favor as he goes along, which explains stealing bases, automatic home runs, and other rules of the game in ways that are surprisingly inspired and very funny. Predestination (a 2014 film, I think) which I did not see until 2015 has stuck with me like no other 2015 film. One thing about it the Heinlein story is only about 10 pages long. After seeing the film I said ‘Fissile Bomber’ that’s not it there, Time Bureau, that’s in there! Nope those are all in the story. This is an amazing adaptation reminded me of John Houston’s adaptation of The Man Who Would be King.